by Martine Villalard-Bohnsack, Second Edition (2003), 149 pp, spiral bound, from the Rhode Island Natural History Survey, Kingston, RI. 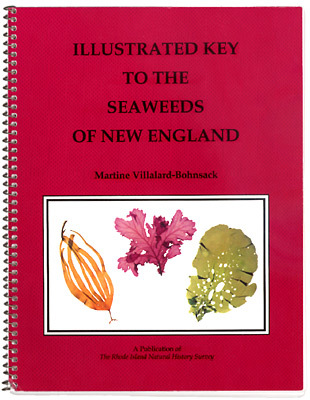 "The Illustrated Key to the Seaweeds of New England was designed for students of phycology and for anyone with an interest in marine sciences. It includes 205 algal taxa commonly found on the open coast, estuaries, and bays of New England (40 green algae, 64 brown algae, and 101 red algae). The key is based on distinct macroscopic and microscopic features as well as environmental characteristics. The text does not require an extensive understanding of scientific terminology. Common descriptive terms are used for the major diagnostic characters, and unavoidable technical terms are defined and explained with illustrations throughout the work. Descriptions are accompanied by black-and-white photographs and drawings of live specimens or of herbarium mounts. A checklist, glossary, and bibliography are also included."